Bring the exotic appeal of a tropical retreat home with you with this swivel counter stool. A welded frame with circular stretchers, curved enforcements, and a triple X design with gold touches on the seat back create a look reminiscent of woven rattan, with the durability and function of metal. The metal is coated in a scratch-resistant electrostatic finish, ensuring the piece can handle the wear and tear of everyday use. 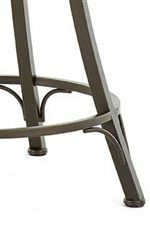 Bonded leather upholstery on the stool seat provides comfort, while a heavy-duty 360 degree swivel mechanism allows you to sit down and get up with ease. 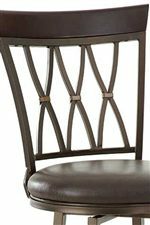 Create a relaxed, island-inspired bar or pub dining area with the Bali counter chair. 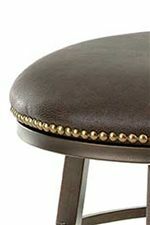 The Bali Swivel Counter Stool with X Back by Steve Silver at Walker's Furniture in the Spokane, Kennewick, Tri-Cities, Wenatchee, Coeur D’Alene, Yakima, Walla Walla, Umatilla, Moses Lake area. Product availability may vary. Contact us for the most current availability on this product.